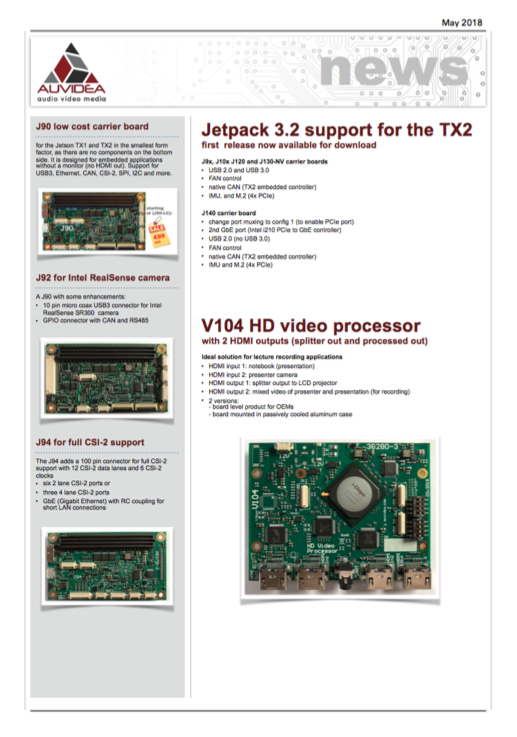 The J120 carrier board turns the Jetson TX1 compute module into a super-mini-computer for desktop usage and for integration into UAVs and drones.It is very compact. 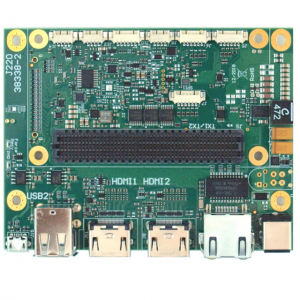 It has the same height as the TX1 (50 mm) and extends to one side to make space for standard connectors for Gigabit Ethernet, two USB 3 type A and mini HDMI. It features one M.2 type M slot for ultra fast SSDs (2280 form factor) which is connected via 4 PCIe lanes to achieve a read and write performance up to 2500 Mbyte/s. 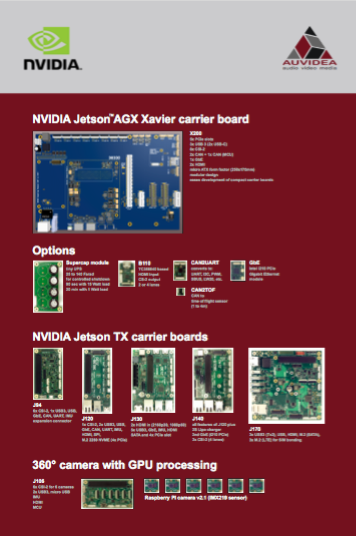 This block diagram shows a minimum CAN centric flight controller based on the Jetson TX1. The motors are controlled via CAN based ESCs like the ESC32 by Autoquad. Positioning data is provided by the Auvidea CAN2GPS module (38183) with Ublox MAX8W. An USB3 based stereo camera may be used for visual navigation and object detection.The integrated IMU (MPU-9250) senses 9 axis: 3 linear, 3 rotational and 3 magnetic axis. The IMU is connected to the SPI bus 0 of the Jetson TX1, so that the processor can sample the IMU at its full data rate. 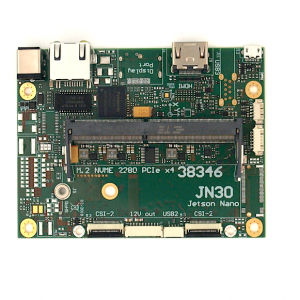 The J120 also features I2C and SPI (2 channels) external interfaces. However it is recommended to use these to connect to peripherals and sensors. It is preferred to use the CAN busses for these interfacing, as the CAN bus is optimized for harsh environments to support high speed communication and low error rates. 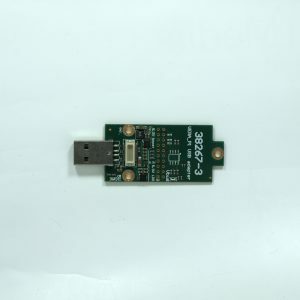 It is also recommended to use CAN to connect to the ESCs controlling the motors. Compared to PWM controls CAN provides a digital link and a data return channel, so the controller can retrieve data from the ESC like an accurate rpm reading. 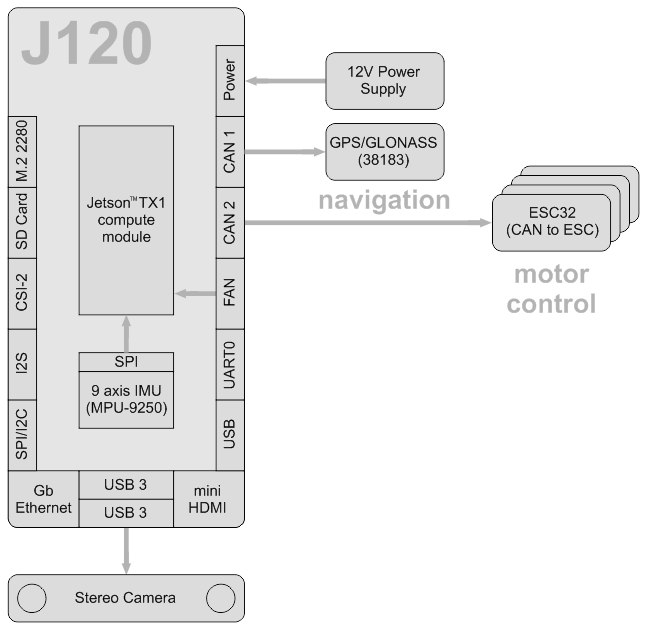 The J120 features CAN controllers which are connected via the SPI interface. A bug in the TX1 prohibits the use of spidev0.0. If it is accessed then the spidev0.1 is blocked. Please see the technical reference manual for details. So for CAN to work, the CAN controller 1 chip has to be physically removed. Only one CAN interface is supported (CAN2). So the J120 rev 3 is only equipped with one CAN interface. This is still under investigation and might be fixed in the future.